The Lower Cache la Poudre Water Quality Monitoring Program is a part of the Environmental Protection Agency's (EPA) most comprehensive environmental leadership program: Performance Track. It joins together the cities of Fort Collins and Greeley, with the Town of Windsor, the Boxelder and South Fort Collins Sanitation Districts and Carestream Health in an ongoing collaborative effort to monitor and protect the Cache la Poudre River. Read the Coloradoan article (PDF 84 KB). The integrated monitoring program now supports 10 sampling sites on the river from Fort Collins downstream to Greeley. 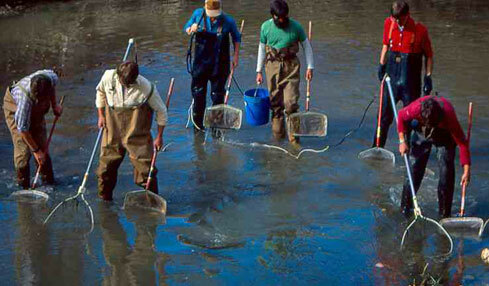 Colorado State University provides the program's expertise in field sampling and data collection for fish and benthic (bottom dwelling) invertebrates. Chemical, physical and biological monitoring data from participating agencies is shared via the Colorado Data Sharing Network. The reports are available for 2008 (PDF 8.0MB), 2009 (PDF 9.8MB), 2010 (PDF 7.3MB) and 2011 (PDF 21.1MB), 2012 (PDF 5.2MB), 2013 (PDF 5.1MB), 2014-15 (10MB).